Since the first time I picked up my father’s Lordomat 35mm camera decades ago, I have experimented with the medium. As I advanced through schools and my education I considered various photographic careers, but ultimately decided that a career in photographic education would allow me to keep my artistic photographic practice tangential but not central to my vocation. I have been very fortunate to have the opportunity to use my photographic interests and skills to create art. Several (pinhole cameras, cyanotypes, palladium, etc., but wet-plate collodion is my passion). The particular process presented in this exhibition is relievo ambrotype. 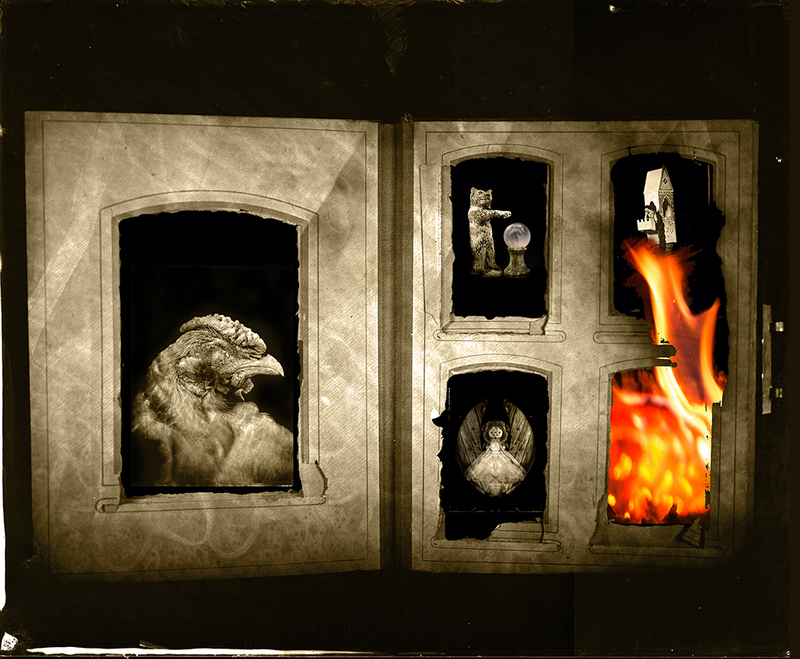 The relievo ambrotype process is a 19th-century photographic technique that incorporates multiple layers of photographs to create a single image. The foundation of the process is wet plate collodion. The wet plate collodion process is capable of producing different kinds of photographs: it may be coated onto a piece of black metal to produce a tintype; it may be coated onto a piece of glass to produce a negative from which it is possible to make positive prints; or if the processed glass plate is backed with a piece of black material the result is a positive image called an ambrotype. John Urie introduced the relievo ambrotype in Glasgow in 1854. Relievo refers to a sculptural technique in which shapes project from or recede into a surrounding background. The relievo ambrotype achieved this relief effect by layering the glass collodion image plate over another image or background. This process was used almost exclusively for portraits between the 1850s and 1860s, and the backgrounds (usually fabricated) situated the subjects – e.g. identifying the Civil War soldier in his battlefield, indicating the sitter’s social status, or creating a potentially faux document of a visit to an exotic locale. Digital photography for me is too quick, perfect and sterile. I have always enjoyed playing with the photographic medium. While this is, of course, certainly possible with digital manipulation (e.g. Photoshop), I prefer to create handcrafted images. I love tactile practices. I have always been interested in 19th-century photography, especially Civil War and Westward expansion photography. Wet-plate collodion was the dominant practice during those years. It still fascinates me to consider the fortitude it must have taken to use this process, which we now view is very cumbersome, to make images soon after battles, or after scaling to a 10,000 foot precipice. Moreover, the process makes truly unique images. While prints may be made from wet-plate collodion negatives, ambrotypes made from this process are one-of-a-kind. The relievo ambrotype allows me the option to play with and blend both 19th-century and contemporary photographic techniques and practices. I am trying to blend the look of the antiquated wet-plate collodion process with contemporary digital imaging. I will often photograph older or timeless objects with the wet-plate process and more contemporary subjects for the digital component. It is critical to me. While I certainly fully appreciate and love all that digital imaging offers, for my personal practice, digital photography is less fulfilling. I have always loved working in the darkroom and would dearly miss the tactile process of image making. The process helps me to slow down and really study what it is that I am photographing. I think it is both a reaction and compliment to digital imaging. I appreciate the speed and flexibility that digital photography offers, but I love the meditative, methodical wet-plate collodion process. It may take me several days to complete a single work. But, the antiquated and contemporary processes complement each other in my works. The relievo ambrotype process allows me to blend antiquated, alternative process with contemporary digital image making techniques. Not always, but yes with the digital relievo ambrotypes. Yes, it very much informs the content of my work. While wet-plate is still my passion, I do also love the options that digital imaging offers me. I can manipulate the images in multiple ways. In the fast-paced, Instagram world in which we live, I think it is important that some artists slow down and use their hands to craft images. Digital imaging, and all that it offers, is fantastic and should be embraced, but it is critical that we not loose sight of the slow, handcrafted image. Reminder – Rendering The Spirit opens on Friday, May 18, and runs through April 11. The artists’ reception will be held March 26 from 6-8pm at Glen Echo Photoworks, 7300 MacArthur Boulevard, Glen Echo, Maryland, 20812.